1988's Die Hard became so synonymous with action-adventure that for years screenwriters used it as shorthand to describe their new project to producers and investors. Everything was "Die Hard in a..." "Die Hard in an airplane", "Die Hard on a train", "Die Hard on a submarine". Perhaps it's only legend, but perhaps a clueless screenwriter really did try to pitch his story as "Die Hard in an office building". Die Hard was released into an era when the muscle men were the kings of action-adventure. Sylvester Stallone and Arnold Schwarzenegger were the names that came to mind when one thought about action movies. Into this environment, Bruce Willis as New York cop John McClane brought the freshness of originality. This was Willis' first major starring role; he was more familiar to audiences as the sarcastic detective and love interest from the television show Moonlighting. Not even a kickboxing or martial arts champ, he is believable as an average guy up against impossible odds. McClane's personal life is a mess. While he's determined to stay with his police career in New York, his wife Holly (Bonnie Bedalia) has followed her skyrocketing career to an impressive office in a skyscraper in Los Angeles. McClane has been anything but supportive and this is looking like the marriage that can't be saved. McClane has arrived in Los Angeles at his wife's office just in time for the office Christmas party. He has come in an attempt to save his marriage, but his unexpected arrival only kicks off an argument with his wife. While he is cooling off and Holly has rejoined the party, the building is invaded and seized by a team of heavily armed terrorists. Led by ruthlessly elegant eurotrash criminal Hans Gruber (Alan Rickman), the terrorists take the partygoers hostage, and only McClane is on the loose to thwart their plans. The terrorists are after over $600 million in negotiable bearer bonds stored in the corporation's safe, and they think their plans accounted for everything, including the heavy police presence outside the building. But they didn't account for one out-of-jurisdiction cop loose in the building, turning their own weapons against them. In what would become a signature of Bruce Willis actioners, McClane gets the stuffing beat out of him. But the man is like an Energizer Bunny with a Timex watch - he takes a licking and keeps going and going. As you might expect, gun battles and explosions are offered in abundance, but the attraction of this action adventure is watching an average guy take on a host of villains and triumph. Directed by John McTiernan, Die Hard was scripted by Jeb Stuart and Steven E. de Souza, based on the novel Nothing Lasts Forever by Roderick Thorp. 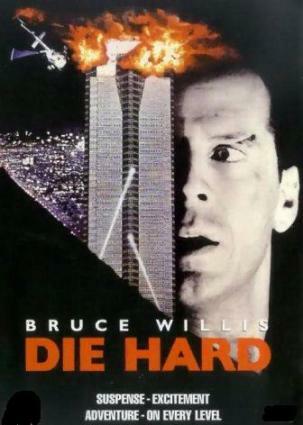 The success of the movie kicked off a franchise of sequels, all featuring Willis as John McClane unexpectedly thrust into situation where he once again had to save the day against impossible odds - Die Hard 2 in 1990, Die Hard With A Vengeance in 1995, and Die Hard 4.0, scheduled to be released in 2006.